The Palm Casita has two large bedrooms and one bathroom. Bubali Garden Homes has a beautiful swimming pool with a nice lounge spot. The property provides a beautiful, lush garden with a palm tree gallery, mango trees, passion fruits and cherry trees. We are located in a quiet area just 1 mile away from Eagle beach. Bubali Garden Homes is ideally located on the island. The Palm casita and the Mango casita are build on a large lot. You can rent the casitas together or separately. The accommodation is situated in a green landscape; when you enter the area you feel a relaxing quiteness. The natural fresh sensation that the palm trees gallery provides, is what makes this place so unique. The casitas are wonderful for a family or couples looking for a nice and good priced place to stay with a great location! We are located in a quiet area but yet all the things you would like to do and see are ver close nearby! The two casitas are situated around a nice shaped swimming pool with in the backyard a beautiful green garden. The special space we offer is the green garden. The natural fresh sensation that the palm gallery provides is what makes this place so unique. The pool is shared between the two Casitas on the property. we accommodate max 8 guests. 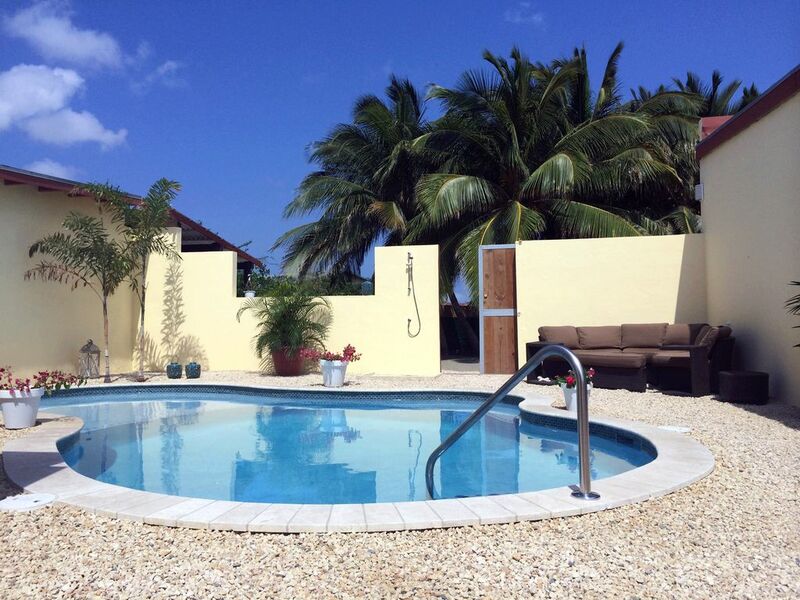 These side by side casitas are ideal for 2 families of 4 to enjoy Aruba. Close to everything. Pool was amazing to lounge by and Kiki and Frans are always on hand to help in any way. Everything in the pictures are exactly as shown! Dreux, thank you very much for your lovely review. We hope we can welcome you again some day, in the Palm Casita! Family of 4 includes 2 kids. We enjoyed our stay in this perfectly located home. Mins from grocery store, mins away from Eagle beach, 10 mins away from main strip and palm beach. What was great was having the owners on site always there to give advise and recommendations. House was very clean and had everything you need to make you vacation a relaxing one. The pool in the back was nice to have a quick dip in the afternoon or late evening. Would definitely come back and stay here. You do need a car to explore this great island. Joe, thank you very much for your nice review and we are happy you enjoyed your stay in The Palm Casita. If you come back to Aruba, it would be lovely to welcome you as our guests again! We`ve stayed 10 days in February. Frans & Kiki were great, very helpful when needed. Excellent location, very close to everything, beaches 5 min drive, SuperStore 2 min drive. The house is very clean and very spacious. Pool is great for the evenings. Need a car to go around the island. Thank you very much for your review! We hope to welcome you again as our guests next year. Great location for a lovely holiday! In August 2016 we've stayed in the Palm Casita at Bubali Garden Homes for a week. The reception by the owners (Kiki & Frans) was great, they're very friendly. The house is clean and very spacious for four people, it has everything you need. Beside this, they have a BBQ which you can use. There's a nice pool (that lights up in the evening) in the backyard that you share with the people in the other casita. Both casitas have their own terraces which you don't share. The house we had, had even two terraces which was perfect because we could choose to sit in the sun or in the shade. Kiki and Frans are great people who are always there to help you with whatever you want or need and they even brought us a few times to the beach when we didn't have a car yet. We were fortunate to spend five weeks at this resort. We found it to be very convent as far as location. Supermarkets very close by and the beach was only a few blocks away. The resort offered everything to make your stay a pleasant one. Would defiantly rent again if we have the opertunity to return. The owners were a pleasure to deal with.Would recommend it to any friend or family headed to Aruba. I would recommend having a car as other things are a ways away. Taxi's are available! The refundable damage deposit of US$ 200,- is required on arrival.